When Ron Capps rolls into Auto Club Raceway for the season-opening NHRA Winternationals, it will mark his 15th year with Don Schumacher Racing (DSR). That’s quite an achievement for any professional racing driver, especially for one who was the 2016 NHRA Funny Car World Champion. 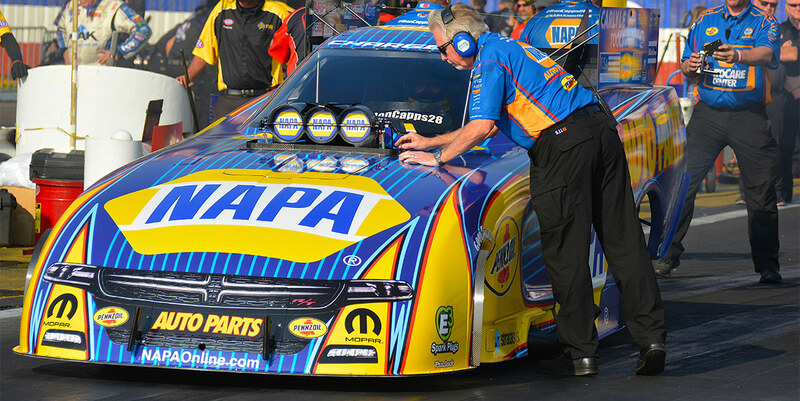 It takes a lot of hard work and commitment, which is exactly why Ron’s long-standing sponsor, NAPA Auto Parts, will also be along for the ride. Looking back at the 2018 NHRA season, Ron claimed victory at three events and finished fourth in points for the season. Along the way, he accumulated an impressive points lead, but as in racing, it’s a moving target with 15 other competitors just as determined as you to go to the next round and win. Regardless, Ron always strives to do better, not just for himself, but also for his sponsors and fans. “We were always talked about in the championship, so I think that 2018 was a little bit of a letdown for us. We had a chance going into a couple races toward the end of the season to win a championship, but it just wasn’t in the cards,” said Ron. With 2018 in the rearview mirror, it was time to move on and start planning on the upcoming 2019 season. For Ron, it’s both a physical and mental workout to stay focused as a driver and not lose sight of what needs to be done before heading to Pomona. “I’ve spent a lot of time as usual in the gym trying to stay physically fit by playing racquetball. It’s a great physical activity and with the ball travelling 150-plus mph, it helps keep my hand-eye coordination up along with keeping me in good overall shape,” remarked Ron. In addition to staying in shape during the off-season, the team was hard at work in the shop preparing the new Dodge Charger SRT® Hellcat Funny Car bodies. Ron wants to make sure he, his racecar and the equipment are all in top-notch condition when they line up to a competitor in the next lane. When the DSR NAPA Auto Parts transporter rolls into the pits at Auto Club Raceway, Ron and his team will be ready to rumble with the competition. They’ll have a new car that should give them an advantage over the rest of the field jockeying for a good qualifying position and looking to go rounds during eliminations at the NHRA Winternationals. “We all worked hard on getting the first Charger [SRT] Hellcat body on Hagan’s car last year. The SRT engineers really worked on the front end and the balance of the car. This year, I think we can help with making all of our DSR team Funny Cars a little better and put us back on the top of the list,” observed Ron. Like his DSR Funny Car teammates, Ron knows it takes a lot of mental preparation, teamwork and communications throughout the season. He and the other drivers are in the hunt for a world championship and will stop at nothing to achieve it in the 2019 season. “Our goal is to make the countdown, obviously, but to always go in number one in the regular season, win as many races as we can. We need to prepare ourselves ahead of time for what’s going to happen in the countdown. 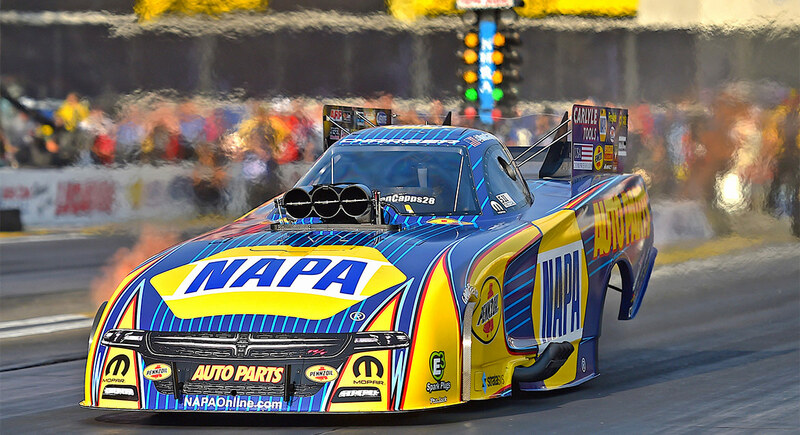 I think with Rahn Tobler (crew chief – NAPA Auto Parts Funny Car), there’s nobody better at doing that. I feel like the team has developed a really great chemistry,” said Ron. With the historic NHRA Winternationals just a week away, it has many wonderful memories for Ron, especially since he has attended almost every race at Pomona since he was a kid. As a driver, those memories are magnified and get even stronger. “My favorite Winternationals memory is probably 2016, when we won the event and the world championship later that year. It marks the moment when Rahn Tobler and I became a notch better together as a team. We had a lot going on with the balance of the car and my driving, but we learned a lot that Winternationals weekend. We had sort of a pow wow and it was like a brother-to-brother talk which was one of the most important in my career,” said a reflective Ron. Sometimes, it’s the simple things that make drivers and crews work just a little harder to achieve those championship goals.